As soon as I heard about multiple National Time Trial champion Michael Hutchinson's new book, I was eager to get a hold of it. I am a huge fan of his columns in Cycling Weekly, and of cycling science, so the two together were a highly appetising concept. I planned to save Faster... to read on holiday over Easter, but I read the first few pages and ended up devouring it in a single afternoon. The overall aim of the book is, as the title suggests, to examine all of the factors behind the speed and success of the world's best cyclists. It is not written as a training manual, such as The Obree Way, but the investigative side is interlaced with Hutchinson's (highly successful) personal story. For example, we are told about his personal history with Team GB (which I'll speak more of later) and his brush with professionalism. I think the 'obsession' part is mostly contained within this section, at least personally, disclosing that he has slept in an altitude tent for the past 10 years! Hutchinson reels off his personal stats, which are for want of a better word - superhuman. Although he still manages to apply his characteristic self depreciating humour, stating that despite this, he still manages to be inefficient, both physiologically and due to his un-aerodynamic huge calves! These enable comparisons between himself, as a rider on the cusp of professional riding, professionals such as Alex Dowsett, and ourselves. Hutchinson's recovery rides are above 200 watts, a figure I'm quite happy to achieve for any non-race ride! Much of the book focuses on British Cycling/Team GB and their phenomenal success over the past 8-10 years or so. Hutchinson gets unprecedented access to the British Cycling system, the science and the techniques behind their success, presumably due to his close connections and history with the establishment. This comes to a head when he finds himself in an unwelcome situation during product testing, stating the 'No Admittance' signs were directed at absolutely everybody! One of the key things that comes across is the attention to detail, and willingness to research every little thing. This took place in the 'secret squirrel club' under the watchful eye of Chris Boardman, a pioneer of aerodynamics in cycling whilst riding and since retirement. A fine example of this comes with highly developed skinsuits, to which Boardman's wife casually remarked, 'but have you tried them wet?!' to deal with inevitable sweaty riders. On the subject of skinsuits, Hutchinson recounts a tale of riding naked round a velodrome in order to determine if bare skin was faster! It wasn't, thankfully. The riders are also obviously a prevalent area of investment for British Cycling, both in terms of selection and training. Specificity is the key in both of these, with a rigorous selection process for the team, tailored to each event. For example, there was a definitive time of 4:30 for a 4km time trial, with no exceptions no matter how close. The selection of riders went even further than this. For example, Bradley Wiggins was apparently slower than other riders for the team pursuit, yet he was able to put in a longer effort, allowing the quicker riders to recover more. Once selected, the riders were given specific training plans, focusing predominantly on their weaknesses, with a low percentage of work on their strengths. For example, Rebecca Romero, former Olympic rower, had endurance but not so much speed. Therefore, she was given a training plan of riding on rollers with a low resistance in order to increase leg speed. Throughout Faster..., it becomes evident that whilst the science is a huge factor in their success, the overall system clearly pays dividends. For example, Team Sky take the riders favourite pillows to the hotel each night during a stage race, and Team GB riders live in the same house behind the velodrome rather than having to travel to train, and enabling them to recover, beating the monotony of rest days together. Soft drinks are also banned, in order to encourage riders to hydrate with meaningful liquids, i.e. protein shakes or fruit juice. Attention to detail - the now legendary marginal gains policy - is obviously the key in all areas of business. 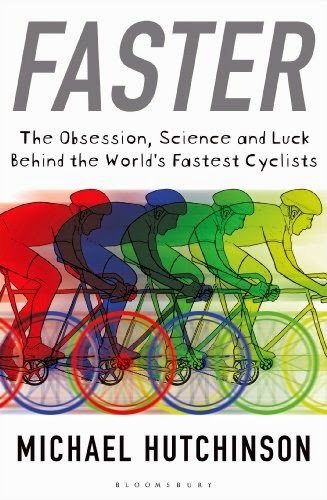 The style in which Hutchinson writes 'Faster: The Obsession, Science and Luck Behind the World's Fastest Cyclists' is also a huge contributor to my enjoyment of it. His characteristic self depreciating humour comes across constantly, sure to be a hit with fans of his column. I also think the level of detail he goes into is just right. Despite obviously having reams of information from his research, Hutchinson keeps it at a level that will entice both cycling fanatics looking for an edge, and others that have witnessed British cycling's meteoric success, and are curious to find out about it. I wholeheartedly recommend this book, to cyclists and non-cyclists alike. Tour of Flanders 2014 - This is Sparta!